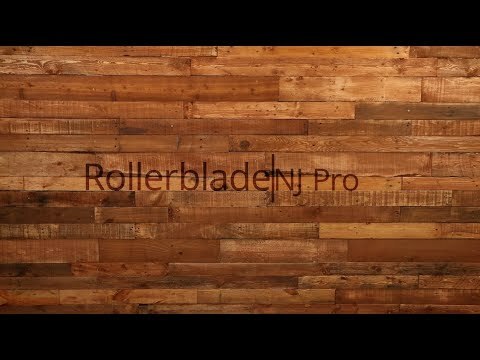 The NJ Pro is the Rollerblade Team Skate top pick. The 60mm / 88a Hydrogen wheels, SG7 Bearings and 42mm anti rocker wheels allow this skate to move with a few strides and grind like a champ. The NJ Pro Street Skate soul plate is built with UFS (Universal Frame System) and has four replaceable soul and negative inserts. The inserts stick up above the Soul Plate, this reduces friction when grinding. The Blank Liner works with the NJ Pro Shell to complete the fit. To canceling out heal lift the Cuff buckle, 45dgre strap and laces pull the shell in to place. Cuffs are removable so you can switch out colors. A: Bearings are the SG-7 which are solid bearings for the price ($29,99) for a full set. You will end up with extra bearings but as an aggressive skater you may need the extras if you blow them out at some point. The wheels on this skate is the 60mm Hydrogen street wheels which we don't currently have in stock by can order for you if you contact customer service. That would get you rolling with all 8 wheels touching the pavement. Q: Can it be used with 4 wheels? A: Yes, you will need to add the wheels obviously but you will also need to add bearings as the anti rocker wheels do not come with bearings. A: Nope, go with the 11.5 - you don't want to go too big in any skate since it can cause discomfort while skating. Best fit is a snug fit and most all skates will fit similar to standard daily shoe size.